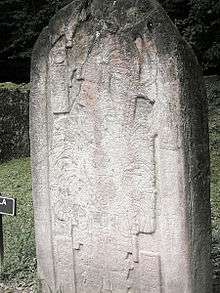 Stela 16, erected in 711 representing Jasaw Chan K'awiil I. Before advances in the decipherment of the Maya script revealed this reading of his name, this ruler was also known to researchers as Tikal Ruler A, Hasaw Chan K'awiil or by the nickname Ah Cacao. One of the most celebrated of Tikal's rulers, Jasaw Chan K'awiil's reign came at the end of a 130-year-long hiatus in Tikal's historical record, and his defeat of the rival Maya city of Calakmul in 695 is seen to represent a resurgence in the strength and influence of Tikal. Two structures at Tikal in particular are associated with Jasaw Chan K’awiil. Tikal Temple I is a classically Petén-styled stepped pyramid structure which served as this ruler's tomb, although it is unclear whether it was built for this specific purpose. Tikal Temple II served as the tomb for his wife, Lady Lahan Unen Mo' (died c.704). His successor was his son Yik'in Chan K'awiil. ↑ The ruler's name, when transcribed is ja-sa-wa CHAN-na-K'AWI:L-la, translated "K'awiil that Clears? the Sky", Martin & Grube 2008, p.44. ↑ These are the dates indicated on the Maya inscriptions in Mesoamerican Long Count calendar, Accession: 9.12.9.17.16 5 Kib 14 Sotz', Martin & Grube 2008, p.44. 1 2 3 Martin & Grube 2008, p.44. ↑ Martin & Grube 2008, pp.44-45. ↑ Martin & Grube 2008, pp.46-47. Wikimedia Commons has media related to Jasaw Chan Kawiil I.